One more guest post by Evan Michelson of "Oddities" and the Morbid Anatomy Library documenting our trip through Italy researching the history of the preservation and display of the human corpse. Recently Joanna and I paid a visit to the remarkable relic of Saint Catherine of Siena, that city's patron saint. 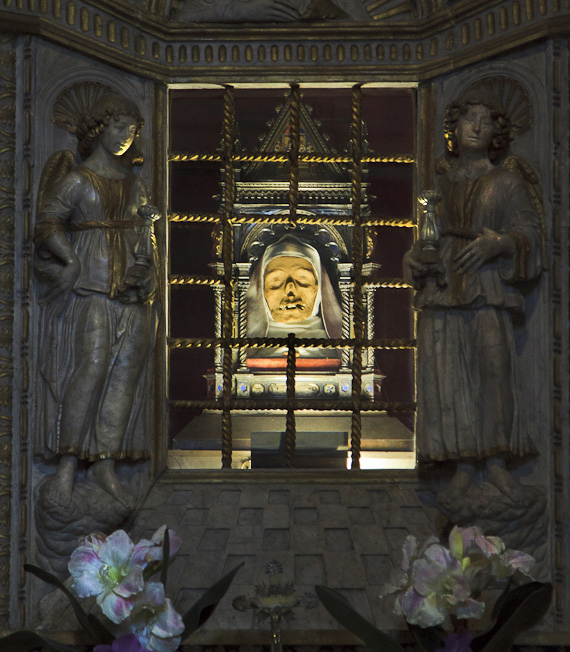 Her incorruptible, mummified head lies behind a screen above an altar in Siena's Basilica of San Domenico. Apparently it was smuggled out of Rome in a sack by her followers, who wished to have her worldly remains reside in the city where she was born. Dramatically lit, her head has weathered the centuries well. Catherine is one of Italy's most important holy women, known for her vivid and voluminous correspondence with Popes, Kings and various heads of state. She was also a remarkably powerful woman in her time, having served as a political ambassador for Florence (a rarity in the 14th century). She had taken a vow of celibacy at the age of seven and considered herself a true bride of Christ, having entered into a "mystical marriage" with Jesus while still a teenager. She also suffered from what sounds like anorexia or bulimia for much of her life - obsessively fasting and vomiting until she couldn't eat anything at all, and she died quite young. Catherine was both revered and thought to be something of a dangerous fanatic in her lifetime; believe or disbelieve, her life spent nursing plague victims, pursuing political peace, recording ecstatic visions and reading the minds of her fanatical followers makes for a compelling story. You can read future posts by Evan both on this blog and on her Facebook page, which you will find by clicking here. The photograph is my own. Click on image to see larger version.